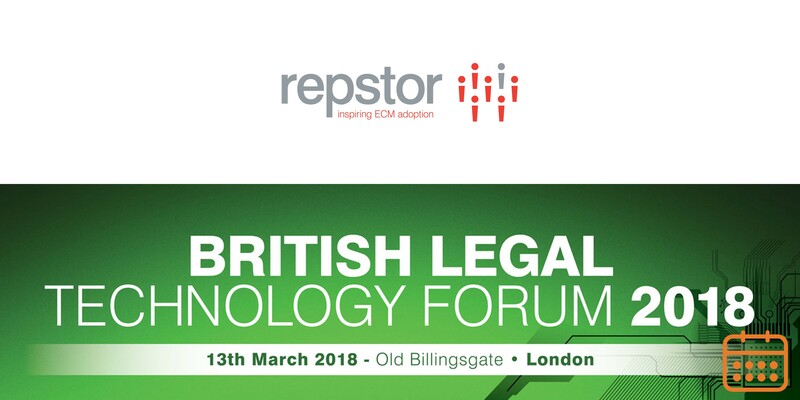 January 29th, 2018 –Repstor, the company that helps businesses exploit their SharePoint and Office 365 investments for matter lifecycle management, has confirmed that it will participate in this year’s British Legal Technology Forum (BLTF) in London. The event will take place on March 13th. Last year, Repstor made a big splash at BLTF with its launch of ES /Unity in partnership with international law firm Eversheds Sutherland. The powerful legal matter management solution, which works with companies’ existing Office 365/SharePoint systems, has attracted a strong client base among corporate legal teams since its launch. National Grid, Wellcome Trust, Queen’s University Belfast, and Miral, an asset management company in the UAE, signed up within the first few weeks, and business continued to be brisk throughout 2017. This year, the company will showcase its Office 365-native products including Matter Management; Repstor affinity, the only truly native SharePoint Outlook integration delivering both online and offline access to SharePoint content plus other repositories including M-Files, High-Q, Microfocus Content Manager, OpenText etc; and Repstor assist, categorisation technology that provides fast and accurate SharePoint email filing as well as other content stores and offers suggested locations based on existing filed content. Repstor’s products have attracted worldwide interest because they increase return on Office365 and SharePoint investments. In particular by adding case and matter management to Office365, the company has experienced enthusiastic take-up among law firms and corporate legal departments. The 2018 British Legal Technology Forum, Europe’s largest legal technology conference and exhibition, will take place on Tuesday, 13th March at London’s Old Billingsgate. Some 1,200 visitors from the world of law, legal technology and IT security are expected to attend, to debate and discover the systems, strategies, processes and platforms that will drive law firms and legal businesses into the next decade and beyond.